Phylum: Chordata Class: Mammalia Order: Diprotodontia Family: Macropodidae When did it become extinct? This kangaroo became extinct around 40,000 years ago. Where did it live? The giant short-faced kangaroo was found only in Australia. An enduring image of the Australian wildlife has to be a kangaroo with a cute joey emerging from its pouch. Kangaroos are the quintessential Australian mammals. Among the most familiar of all the marsupials, they have adapted to almost all the habitats the Australian continent has to offer, including open plains, forests, rocky outcrops, slopes, and cliffs. There are even tree-dwelling Kangaroos. These marsupials have a distinctive body shape: a stout body, massively enlarged hind limbs, and a long, muscular tail. Lots of animals hop, but the kangaroos are the largest animals to use hopping as their preferred mode of locomotion. The kangaroo's hop is actually a very efficient means of getting around as it requires very little muscular effort at moderate speeds. The tendons that stretch down the back of the hind legs to the hugely elongated feet act like springs, and when the animal has gained momentum, these springs help supply much of the power for the hop. Like the limbs of the fleet-footed placental mammals, for example, horses, which end in a single hoof, the digits on the hind limbs of many kangaroos are reduced, and only one of them, the fourth toe, may be in touch with the ground, thus minimizing friction. The large tail acts like a counterbalance at high speed and as a prop to support the body weight of the animal when it's moving about slowly, foraging. As well adapted as they are, the kangaroos have not escaped the devastation that has seen the extinction of numerous Australian marsupials. Of the 53 species of kangaroo and their close relatives that existed when Europeans first reached Australia, six have become extinct. If we go even further back, into the late Pleistocene, there were many more species, all of which have since died out. The largest living kangaroo by quite some margin is the male red kangaroo, which can stand around 1.8 m tall and weigh in the region of 90 kg. We have seen how the mammals from thousands of years ago were far larger than their extant relatives, and the kangaroos are no different. 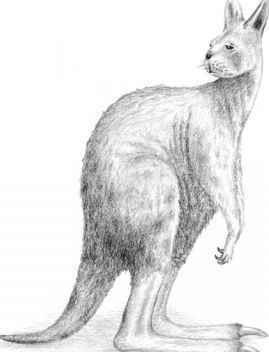 The giant short-faced kangaroo was a big marsupial. In life, it probably weighed in the region of 200 kg and reached a height of 2 m. Unlike the largest living kangaroos, this extinct giant had a large, koalalike head with eyes that were more forward facing than those of living kangaroos and hands with long, central fingers, resembling grappling hooks, instead of normal paws. The feet of this hopping brute were reduced to a single, large fourth toe tipped with a single hooflike nail. With such a small surface area in contact with the ground, the animal could hop around the open forests and plains of Australia with considerable efficiency. All the large living kangaroos are dedicated herbivores, and we can safely assume a plant-based diet for the short-faced kangaroo. Its koalalike head suggests a leaf-eating habit. Perhaps it used the grappling hooks on its forepaws to bring high tree branches to within reach of its mouth to nibble the leaves. Marsupials, like all mammals, cannot digest plant matter without the help of symbiotic micro-organisms. Animals like cattle have a chambered stomach that allows plant food to be broken down by the micro-organisms. Kangaroos have a similar system, and most of their micro-organisms are to be found in the first chamber of their complex stomach. Although the giant kangaroo was undoubtedly a herbivore, it is difficult to explain why it had forward-facing eyes. Living kangaroos' eyes are on the sides of their heads, giving them a 300 degree field of view, excellent for spotting predators. Perhaps the giant kangaroo was simply too big for the Australian predators to tackle and therefore had no need for a wide field of view. There were once numerous large predators in Australia, and only adult giant kangaroos may have had some protection from these animals because of their size. Forward-facing eyes gave the giant kangaroo a good degree of binocular vision and a better perception of distance than kangaroos with a wide field of view. This could be very important for an animal that was moving at high speed through areas of open forest and tall shrubs, where there were numerous obstacles to negotiate. It may have also helped when reaching up into trees to select the most nutritious leaves. With that said, large herbivores are suited to surviving on low-quality food, and the forward-facing eyes may have given the living animal an advantage we will never fully understand. The giant kangaroo bounded around the wilds of Australia for a long time. The oldest fossils of this animal are around 1.6 million years old, whereas the most recent are 40,000 years old. It seems to have died out at around the same time as the majority of the Australian megafauna. Unfortunately, the definitive explanation for the extinction of these animals is elusive. There are some scientists who believe that the first human inhabitants of Australia are solely to blame, while there is another group of experts who think that climate change was responsible. As we have seen, prehistoric extinctions can very rarely be attributed to a single cause, unless the landmass in question is a small island. In the majority of cases, the evidence indicates a number of causes in combination ultimately leading to the extinction of a large number of species. The probable causes for the disappearance of the giant kangaroo were the spread of humans through Australia and climate change. Humans modified the landscape through their use of fire and probably hunted the giant kangaroo. Climate change made this continent more inhospitable to the large animals, which are often more sensitive to environmental change. ♦ The giant kangaroo was not closely related to the group that contains the large, living kangaroos. Its closet living relative is the banded hare-wallaby (Lagostrophus fasciatus), a small animal, barely 2 kg in weight, that is extinct on the mainland. ♦ The group to which the giant kangaroo and the banded hare-wallaby belong is known as the sthenurinae (Greek for "strong tails"). This group of marsupials diversified about 2 million years ago, and it was once represented by numerous species, all of which are now extinct, apart from the banded hare-wallaby. 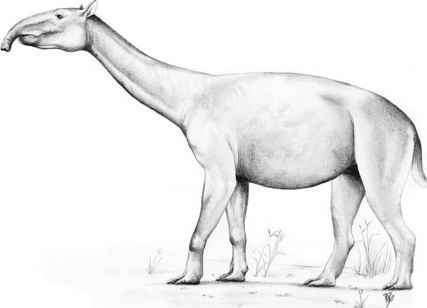 The giant short-faced kangaroo was the largest, but many of the other species were also very large, far bigger than the living red kangaroo. ♦ The bones of the short-faced kangaroo have been found in many sites across Australia, including the Naracoorte World Heritage fossil deposits in South Australia. Further Reading: Helgen, K. M., R.T. Wells, B. P. Kear, W. R. Gerdtz, and T. F. Flannery. "Ecological and Evolutionary Significance of Sizes of Giant Extinct Kangaroos." Australian Journal of Zoology 54 (2006): 293-303. Scientific name: Zaglossus hacketti Scientific classification: Phylum: Chordata Class: Mammalia Order: Monotremata Family: Tachyglossidae When did it become extinct? The giant echidna died out about 40,000 years ago. Where did it live? 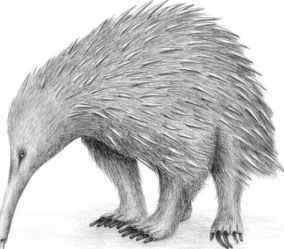 The remains of the giant echidna have only been found in Australia, but its range may have included New Guinea. The monotremes are a very odd group of mammals that have perplexed zoologists for decades. In some ways, they are unquestionably mammals as they have fur, nourish their young with milk, and are able to keep their body temperature constant by metabolizing food. However, they also have some reptilian features, that is, they lay eggs and their feces, urine, and eggs emerge from a common opening: the cloaca. The first species of monotreme to come to the attention of European scientists was the platypus (Ornithorhynchus anati-nus) when the dried skins of this animal were sent to England from Australia. These skins caused uproar among the zoological fraternity. There were cries of fake! and sham! as many experts of the time claimed it to be nothing more than the abominable creation of a mischievous taxidermist. Gradually, scientists accepted that the platypus was a living, breathing animal and not the work of an imaginative taxidermist. Not long after the platypus came to the attention of Europeans, the echidna was described and named by scientists. Today, four species of echidna have been described, and all of them, more or less, bear a superficial resemblance to hedgehogs. They have long spines on their back, and their small head ends in a thin snout. Three of the living echidna species have a relatively long snout and are known as long-beaked. Long-beaked echidnas are known only from the highlands of New Guinea. The most common living species is the short-beaked echidna, and it is found all over Australia and in some parts of New Guinea. The short-beaked echidna is a specialist predator of ants and termites. It probes the ground and insect nests with its long snout and uses its long tongue to bring the prey to its mouth, in much the same way as an anteater; indeed, another, albeit incorrect name for the echidnas is "spiny anteaters." The long-beaked echidnas are similarly equipped with a long tongue, but theirs is equipped with spines for extracting earthworms from the soil. The echidnas are a specialty of Australasia and are only known from Australia and New Guinea. As with any group of living mammal, these odd animals were once represented by giant species, and up until 40,000 years ago, there lived an echidna as large as a sheep. Today, the largest echidna species is the western long-beaked echidna (Zaglossus bruijni), which can weigh as much as 16 kg; however, the giant echidna was about 1 m long and weighed at least 50 kg. All the living echidnas are specialist predators of invertebrates, so we can be confident that the giant echidna was no different, although it is impossible to tell if this extinct mono-treme preferred to eat ants or worms. The giant echidnas large size may have afforded it protection from some predators, but the thylacine, marsupial lion, and giant monitor lizard were all large enough to tackle an echidna, albeit a giant one. It is therefore likely that the giant echidna was protected with spines in the same way as the living species. The echidna's spines are actually individual hairs, and they are rooted in a layer of thick muscle, which covers the whole body—the pan-niculus carnosus. When a short-beaked echidna feels threatened, it pulls its legs and head under its body and erects its spines. The potential predator is met with a bristling ball of spines, and after a few minutes of getting spiked in the face and paws, it often gives up and leaves the echidna alone. On soft ground, the short-beaked echidna can enhance its defense still further by burrowing into the ground until only a crown of spines can be seen. It takes a very determined predator to beat the echidna's defenses. Like all the other monotremes, the giant echidna must have laid eggs. Unlike a marsupial, an echidna's pouch is not well developed. Outside of the breeding season, the pouch is nothing more than a groove on the female's belly, but hormonal changes around the breeding season cause the groove to become more well developed, until there is a shallow pouch in the female's abdomen. After mating, the female echidna everts her cloaca and deposits a single rubbery egg with a diameter of 13 to 17 mm into the simple pouch. After about 10 days, the young echidna (puggle) hatches, but there are no teats for it to latch on to; instead, it grips a special patch of milk-producing skin at the front end of the pouch. It laps at the pinkish milk and stays in the pouch for 2 to 3 months, until the mother has to turn it out because of its growing spines. Like the short-beaked echidna, the giant echidna probably ranged over much of Australia, but it appears to have been another casualty of the changes that affected Australia 40,000 years ago, and it became extinct with almost all of Australia's varied megafauna. Some experts suggest that climate change was the major cause of these extinctions, but others think that the first human inhabitants of Australia annihilated the native fauna through hunting and habitat destruction. It's very likely a combination of these factors that led to the disappearance of these creatures. ♦ The giant echidna was described from an incomplete skeleton found in Mammoth Cave, Western Australia. A second species of huge echidna has been described from a 65-cm-long skull, so it is likely that the prehistoric Australia was home to at least two species of very large monotreme. ♦ Echidnas have very large salivary glands, and these secrete a thick, sticky saliva that lubricates the tongue as it's protruded in and out of the mouth. The saliva also traps the echidna's prey. ♦ The monotremes are a very ancient group of mammals. The oldest known monotreme fossil is an opalized lower jaw fragment from the Lightning Ridge opal fields of New South Wales, which is around 100 million years old. A fossilized platypus tooth has even been found in Argentina, demonstrating that these animals have not always been restricted to Australia and New Guinea. It is highly likely that monotremes were once found all over the ancient landmass of Gondwanaland. Further Reading: Griffiths, M., R. T. Wells, and D. J. Barrie. "Observations on the Skulls of Fossil and Extant Echidnas (Monotremata: Tachyglossidae)." Australian Mammalogy 14 (1991): 87-101; Pledge, N. S. "Giant Echidnas in South Australia." South Australian Naturalist 55 (1980): 27-30; Murray, P. F. "Late Cenozoic Monotreme Anteaters." Australian Zoologist 20 (1978): 29-55. Where was the giant shortfaced kangaroo found? WHy did the short faced kangaroo become extinct? Why did giant short faced kangaroo become extinct? Where did giant kangaroos live? Who tall can longbeaked echidna get? Where did the giant short faced kangaroo live ? What environment did the giant short faced? How long has the giant short faced kangaroo been extinct for? Why did the biggest kangaroo die out? When did the giant short faced kangaroo lives? When did the giant short faced kangaroo lived? What did the giant shortfaced kangaroo eating? Where did the giant short face kangaroo live? What fossilevidence is there that giant kangaroos existed? Can short faced kangaroos hop?